FILE - A refugee waits for a medical check in the UNRWA health center at the Asker refugee camp, near Balatah, east of Nablus, in the occupied West Bank, Sept. 1, 2018. UNRWA, the U.N. Relief and Works Agency, says it has been able to reduce, but not eliminate a $446 million budget deficit caused by a sharp cut in funding from Washington. It says the shortfall could impact the services the agency provides to millions of Palestinian refugees across the Middle East. UNRWA reports it has been able to raise $238 million in additional funding from contributors such as Qatar, Saudi Arabia, Japan, the European Union, and Canada. This, it says has left the agency with a $200 million deficit until the end of the year. Speaking Tuesday, UNRWA Commissioner General Pierre Kraehenbuehl says he deeply regrets the U.S. decision to no longer support the work of his agency on behalf of about five million Palestinian refugees. He says the United States, which was UNRWA’s single biggest contributor, had made it possible for the agency to develop and implement a range of services in education and health care, relief, and social services. He says it is crucial that UNRWA is able to continue to provide essential services to Palestinian refugees in the West Bank, East Jerusalem and Gaza, as well as in Jordan, Lebanon and Syria. He says new sources of money must be found to help them. “It is also a matter of human dignity for the refugees, but it is particularly also a matter of regional stability in the area that is, you know, that we operate in one of the most polarized emotionally charged environments on the planet,” Kraehenbuehl said. 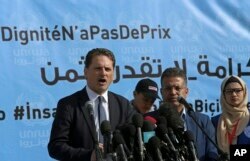 FILE - UNRWA’s Commissioner General Pierre Kraehenbuehl, left, gives a press conference to launch a global campaign to support UNRWA, at the UNRWA Rimal Girls Preparatory School in Gaza City, Jan. 22, 2018. Kraehenbuehl calls Washington’s decision to cut off aid a form of politicization of humanitarian funding, which should have been avoided. He told VOA he is certain this decision is not related to UNRWA’s performance because senior U.S. officials he met in November had nothing but praise for the work being done by his agency. Kraehenbuehl said the Middle East is a tinderbox and he fears increasing numbers of young people could become radicalized if they are denied education and other basic rights and are stripped of hope for the future.